There are so many fun gifts for girls ages, 3-6. I love to try and find really unique girl gifts that will last vs. gifts that will just get thrown in the toy bin after a day or so. There are a few of the popular, mainstream toys on this list, but you might find a few things that your girls may not have seen before. This cool Fisher-Price Teach n’ Tag Movi robot is ready to roll, and get kids moving and learning along with him! With 360 degrees of mobility, Think & Learn Teach ‘n Tag Movi encourages preschoolers to get their minds and bodies moving while teaching them how to follow directions and think critically about the world around them! With 3 exciting game modes and 6 games to choose from, Teach ‘n Tag Movi keeps kids thinking (and moving! ), whether he’s asking them questions to engage their critical thinking skills, prompting them to follow directions to a fun game, or getting silly on the dance floor and showing off his smooth moves. Kids will have a blast showing off their awesome listening skills and rockin’ moves with this interactive learning robot! The Melissa & Doug Wooden Scoop & Serve Ice Cream Counter lets kids serve up yummy treats, made to order! The 20-piece set features a reusable menu card, eight ice cream scoops, six toppings, two cones, cup, scooper, tongs, wooden spoon, and six bills. Lift, stack, and release the scoops onto the cones. This ice cream play set is great for imaginative playtime using your favorite dessert! This Horse Club Riding Academy set from Schleich is just incredible. The attention to detail is fantastic! It comes complete with figures and amazing accessories. New details such as the sweet flowers and new accessories are specially tailored to girls, means even more fun for kids. The Riding Center is equipped with holders for saddles and bridles as well as drinking troughs and hay racks to ensure the horses are well taken care of. On each horse box is a name plate to use the sticker sheet to name the horses! Like all Schleich products, it is highly detailed. The Mobile Vet set is the new highlight product that adds an attractive play scenario to the Horse Club world. Set includes figures and accessories so that kids can start playing right away. A perfect gift for any occasion! All Schleich figures are lovingly hand-painted with detailed modeling and allow children to learn as they play. Younger girls will love this stack ’em high, serve ’em up, Educational Insights Pancake Pile-Up Relay Game! Order up! It’s a busy day at the diner, so don’t dilly-dally. Help your customers get just what they ordered by racing the other servers to the grill – relay style – and piling up pancakes in precisely the right order. The first player (or team) to find ’em, stack ’em and serve ’em up topped with a pat of butter, wins the Pancake Pile-Up game! This Green Toys Cake Maker Dough playset is not your typical toy. This 20-piece set makes it simple for even the youngest dough molder to create delightfully custom cakes. The Cake Maker set features our non-toxic dough bundled with quality tools and fun role play accessories. Use the cutters and stamps to create cakes, cookies, and all sorts of creative pastries. Stack the layers on the cake stand, decorate with the frosting extruder, serve up a tasty masterpiece — and then smoosh it up and start all over! This set is designed to encourage open play and easily age-up with kids of all ages for dough play fun the whole family can enjoy. Manufactured and assembled in the USA, the plastic components are made from 100% post-consumer recycled plastic milk jugs that save energy and reduce greenhouse gas emissions, while the dough is made from 100% organic flour in a food-safe facility. This super-safe set is good for the earth and safe and fun for little ones. It’s also packaged in recycled and recyclable materials with no plastic films or twist ties, and printed with soy ink. Your kids will love to prepare countless creative imaginary meals in this gorgeous Melissa and Doug Chef kitchen! Young chefs will love stocking the shelves and cooking play food in this sturdy and modern kitchen that looks and feels like the real thing. The Chef’s Kitchen includes innovative and engaging details such as a working ‘ice’ cube dispenser with two ice cubes, stove and oven dials that turn, removable burner grates, a microwave plate that spins, moving sink faucet, hooks to hang pots and pans, and a write-on grocery list. The fridge and freezer have separate doors and ample storage space for easy cleanup. Kitchen assembly is a snap with the detailed illustrated instructions. My daughter loved dressing up when she was little and this Moana Adventure Outfit for dress-up is just so cute! This iconic 2-piece outfit features unique prints and the skirt to match. The skirt also has two layers that include fringe details for an authentic Moana Adventure look! Children learn best through play. Combining quality pizza tray, money & topping tiles with fun characters sparks kids’ imagination and drive to learn. This super fun Osmo Pizza Co. game will help teach your young kids addition, subtraction and fraction skills all the way up to fast paced mental math. Osmo Pizza Co. automatically adjusts to your child’s ability. This cute game works with all ipad 2 models and up. Tub toys are always a good idea and this Alex Fashion in the Tub is affordable and so much fun. Tub fashion means paper dolls for the bathtub! Dress your 2 dolls in one of the 31 innovative fashions included in this set! These soft foam cutouts are safe and stick to walls of your bathtub. When bath time is over, pack everything into the drip-dry bag for easy storage. These short bedtime stories are perfect for busy parents. The 365 Stories and Rhymes : Tales of Magic and Wonder makes it so your kids can enjoy a different story every day of the year with this beautifully illustrated treasury. From traditional favorites to new tales, it is perfect for reading together or for children to read to themselves. This Razor Jr. T3 Scooter is the perfect introductory scooter for young girls. It’s patent pending “tilt to turn” steering feature helps tots learn to steer and builds core balance and riding skills. The 3-wheel design is perfect for greater stability and it builds young rider’s confidence. These beautiful and affordable Rainbow Fairy Wings with Glitter will be a hit with your younger girls. These are so much fun for little girls that love to dance and perform. They are durable and washable too. There are lots of designs to choose from like these Pink Monarch Butterfly , Purple Butterfly Wings , Orange Monarch Wings and these Pink Fairy Wings with Glitter . Your kids will love reading the funny story of two inquisitive kids, Ty and Karlie, and build simple, non-motorized models of the robots they construct and fix during their adventure to an automated candy factory! During this zany outing, Ty and Karlie build various robots to perform tasks and solve problems in the factory. The robots have moving parts, wheels, and gears, so kids can learn firsthand about simple machines and gear trains. As you follow the story, you can build models of the ten robots featured in the story. Large, colorful plastic building pieces make it easy for small hands to put the models together. This Kids First Robot Engineer kit is a great gift for young kids that love to build. Budding young sushi chefs will be able to practice their rolling, wrapping, and slicing skills with this unique wooden sushi play set. The two-piece set includes a tabletop display/serving counter that holds all the ingredients for making Maki rolls, nigari, and Tamaki. LAY the wooden sushi pieces on the felt nori strips, stick them together with the self-stick tabs, roll with the sushi mat, then slice and serve with Ginger, wasabi, and soy sauce! order on the reusable menu/information/instruction card and pick up the pieces with Chop sticks! Your girls will love using their imagination with this adorable Melissa and Doug Roll Wrap and Slice Sushi Counter. Find the sticker, peel the sticker, place the sticker. And sticker by sticker, a koala appears! Or an elephant, frog, red panda, puffin, peacock, snake, giraffe, tiger, or gorilla. (And no mess to clean up!) Designed for children ages 5 and up, Paint by Sticker Kids: Zoo Animals uses low-poly art—a computer style that renders 3-D images out of polygon shapes—and removable color stickers so that kids can create 10 vibrant works of art. The stickers are larger, as benefits the younger audience, and the card stock pages are perforated for easy removal, making them suitable for displaying. Brain Flakes from Viahart is a new construction toy which teaches both boys and girls spatial thinking and lets their imaginations run wild! Every jar contains over 500 discs, which means hours of endless fun and engineering education. In addition to brain building, Brain Flakes will improve the coordination and dexterity of young children, keeping both their minds and bodies active! The discs measure 1.3″ across and are 1/10th” thick. They click together and apart easily for all ages and levels of motor skills. They come in a great reusable plastic jar for easy storage. Your girls will love this enchanting Fairytale Castle floor puzzle scene where swans glide in the pond, butterflies flutter around the castle and the princess rides her unicorn. 2′ x 3′ when complete, it features 48 extra-thick pieces with an easy-clean surface to keep them looking like new. These floor puzzles come in several different themes and are both affordable and fun! These soft and beautiful mermaid tail blankets are perfect for snuggling on the couch or lying in bed to read a book. Your girls of all ages will adore having this Mermaid Tail Blanket that is all their own. It comes in lots of beautiful colors and textures. Your girls will adore this self-contained, My Little Sandbox – Fairy Garden . This playset will bring the sandbox or the beach into your home for those rainy or cold days where you can’t enjoy the real thing. Kids will love playing in the ultra fine sand contained in 10 inches 10 inches 2 inches wooden box. This set includes the wooden box, sand, no-mess play mat, themed toys to play in the sand with, and re-sealable box to keep everything together. We have several Learning Resources items at our house and I can’t tell you how much my kids have loved them. This Learning Resources Pretend & Play Animal Hospital will be a really well-loved gift idea for young girls. Tender loving pet care goes anywhere with our portable animal hospital. Role play with hospital encourages participation in caring for family pets. Animal hospital comes complete with a lovable puppy and 34 pieces to ensure a thorough checkup. Write & wipe components let children play again and again. Tri-fold board with pockets stores all components neatly. Keep your girls busy during the snowy and rainy months with a Melissa and Doug Stained Glass Art kit. They come in many different themes-an owl, princess, butterfly and more. This peel-and-press sticker craft gives kids everything they need to easily create a spectacular piece of “stained glass” art. Just hold up the sheet of colored stickers to the clear frame, peel them off one at a time, and stick them on. Grooves and outlines on the frame make it easy to fit each sticker–featuring realistic textures like bubbles or swirls–into just the right spot. Use the included cord and suction cup to hang the finished artwork in a sunny window to see the beautiful butterfly shimmer to life. Young artists will be enchanted by the results and proud to show them off! You will love the quality of these fun Melissa & Doug Palace Pals Hand Puppets . This four-piece hand-puppet set includes a royal collection of characters! Designed to help children and caregivers role-play together in a sweet and simple way, the prince, princess, knight, and dragon are sure to inspire countless creative stories and amazing imaginary adventures. The simple glove puppets fit children and adults and are easy to use, so even the littlest puppeteers can see exciting movement with very little skill—terrific for self-confidence, and also an invaluable booster for motor skills, hand-eye coordination, communication skills, parent-child bonding, and so much more! Made with brightly patterned, washable fabrics and built to last, these soft and sweet hand puppets are sure to be go-to toys for years to come. This My Little Pony Girls’ Rainbow Dash Hoodie will be your young girl’s favorite gift! Your girls will love the bright colors, the fun pony mane that is attached and the 3D wings on the back. These run small, so be sure to order a size or two larger than what you need! They come in toddler, little girl and big girl sizing. This cool Melissa & Doug Mystery Dish Diner Game for younger girls is so much fun. In this game of delicious deduction, players take turns playing customer and server, placing and guessing a secret food order and earning play dollars by correctly interpreting color, shape, and temperature clues. A timer and bell keep the action moving, and the more food items you serve correctly, the more money you earn! 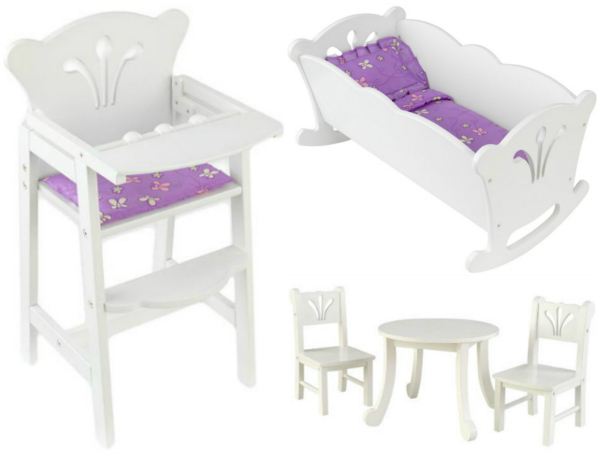 I love the quality of these KidKraft doll furniture sets. We used to have some of these same pieces when my daughter was little and they were very durable and much better quality than a lot of the cheaper plastic sets and the price point on these is very reasonable. The KidKraft Lil’ Doll High Chair , Lil’ Doll Cradle , and the KidKraft Little Doll Table and Chair Set all match and work with many different types of dolls. Kidizoom Duo Camera is a fun, durable and easy to use digital camera with front and rear facing cameras so you can take fun photos and selfies. Special featured Photo Optimization, when you take a photo, multiple shots will be taken and the camera will find the best shot to save. The camera also features movie recording, and five different voice changing effects. There are also fun games with motion control and creativity options allowing you to enhance your photos with a variety of frames, stamps and wacky effects. In addition, Kidizoom® DUO features a Parental Controls setting, it allows parents to limit the play time for the 5 built-in games. You can also disable all games through this setting. Once games are disabled, the game submenu will be hidden in the Main Menu. The LeapFrog LeapPad Ultimate Kids’ Learning Tablet is the most popular kid-safe tablet on the market. The newest version of the Leapfrog LeapPad, the LeapFrog LeapPad Ultimate Kids’ Learning Tablet includes tons of pre-loaded content and it will work with the more than 800+ apps created for this tablet. This ultimate kid-safe learning tablet encourages amazing discoveries with preloaded content featuring core skills in mathematics, reading and science as well as music, puzzles, logic and creativity to prepare kids for school and beyond. It is kid-safe right out of the box, with a kid-friendly web browser that provides access to pre-selected websites all approved by learning experts. You can purchase download cards to purchase additional apps. Magna-Tiles might be one of your most priciest purchases, but these are definitely one of our best toy purchases. My kids have been playing with their Magna-Tiles for years and years. Also, it’s a popular toy when kids come over for playdates. There are smaller sets, but once your kids discover them, you will realize that the larger set is just so much fun. These are also very hard to find at a discount, so if you see a small discount, grab them! 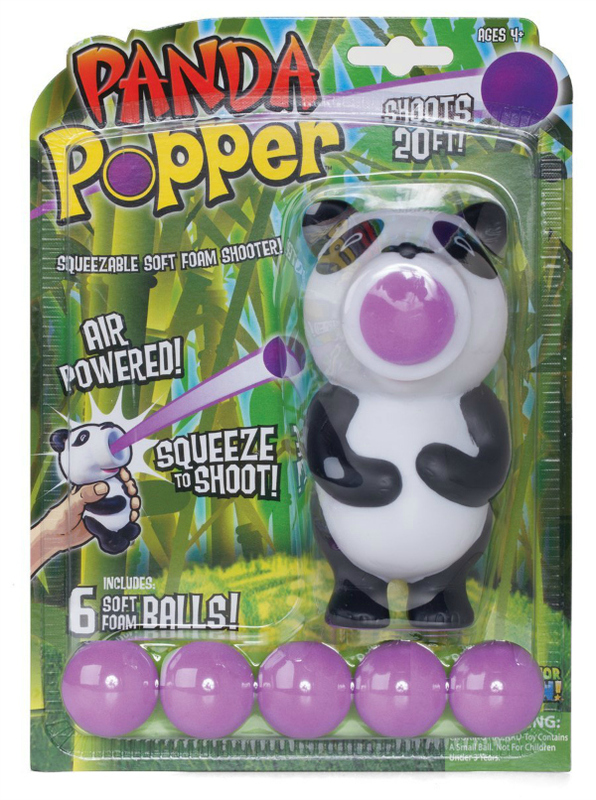 The Hog Wild Panda Popper is big fun for a small price. These Hog Wild animal shooters shoot balls up to 20 feet. The harder you squeeze, the further they go. They are recommended for ages 4 and up and if you have multiple children to buy for, how fun would it be to have a ball popping war? I also love that these shooters are shaped as cute animals and besides the Panda , these come in so many other animal shapes. 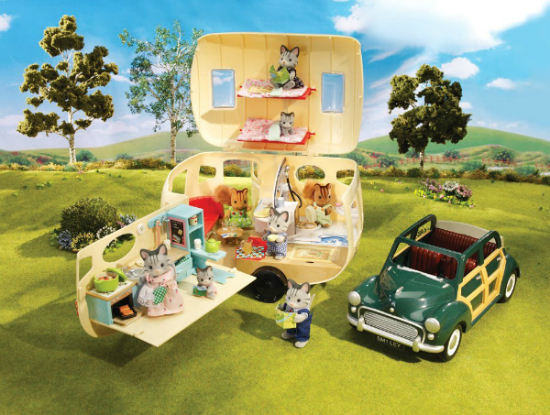 The Calico Critters Caravan Family Camper would make a fun addition to your Calico Critters collection. The vehicle opens up for hours of fun play with your Calico Critters families. There are so many fun pieces like utensils, plates, cups, sleeping bags and so much more. There is a tiny kitchen and bathroom in the camper as well. Note that this camper does not include any actual critters, but there are so many Calico Critter families that your girls will love. Amazon has selected this fun game on their top toys of 2013 list. Your forest friends are hungry and it is your job to help them. This game will help your young girls improve their matching skills and sorting skills, plus they will improve their hand-eye coordination, all while having fun with their forest friends. 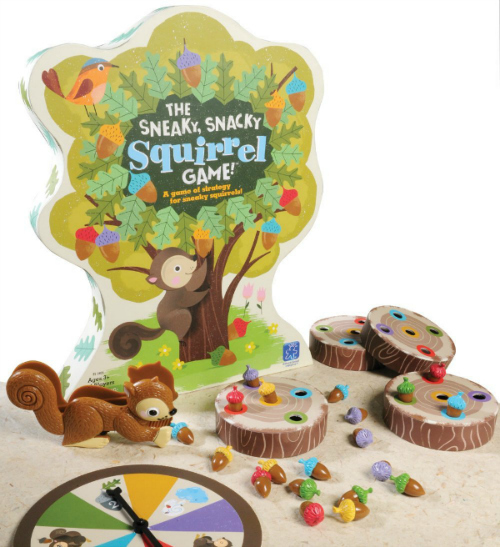 The Sneaky Snacky Squirrel Game is recommended for ages 3 and up and it received the Parents’ Choice Silver Honor Award. If you love this list of great Gifts ideas for young girls ages 3, 4, 5 and 6, and you need more gift ideas, then check out our great gift ideas page. We will be adding more gift ideas and holiday shopping tips all month. Be sure to sign up below for our free newsletter so all the updates comes right your inbox.